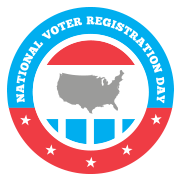 Washington, Sept. 26 – RespectAbility is honored to participate in the sixth annual National Voter Registration Day (NVRD), a nonpartisan effort to encourage people to register to vote and make their voices heard in our nation’s political process. Today, organizations nationwide will register thousands of new voters. However, if you read the news today, many people might feel discouraged, disconnected or unconvinced that their voices matter. Last year, it was clear that getting the vote out mattered with the high stakes of a presidential race and key Senate contests across the country. What about this year? Why should people get out, get registered and get out the voter in a quiet year like 2017? The reason is simple. As the former Speaker of the United States House of Representatives Tip O’Neill famously said, “All politics is local.” Did you know that 59 of the 100 largest cities in America are holding elections this year? Did you know there are 36 mayoral races and more than 360 city council races in 2017 alone? In communities across the country, local, municipal and state elections are taking place this year. Local elections are a great opportunity for people to become more involved and make their voices heard. This is especially important for people with disabilities. According to the Census Bureau, one-in-five Americans has a disability. That means there are 56 million people with disabilities in our country. That number makes the disability community our nation’s largest minority group. Like other minority communities, people with disabilities have fought hard for civil rights. Many from our community still face serious barriers to pursuing life, liberty and the ability to live independently in the community. Because of this, RespectAbility, a nonpartisan, nonprofit organization working to fight stigmas and advance opportunities for people with disabilities, requests candidates to complete the #PwDsVote disability questionnaire on multiple disability topics ranging from employment, education, violence and abuse, criminal justice, healthcare and more. For the 2017 cycle, RespectAbility is asking candidates for governor in New Jersey and Virginia to answer the questionnaire. Answers will be published in full on The RespectAbility Report: http://therespectabilityreport.org/. During the 2016 cycle, the political impact of voters with disabilities was recognized like never before. From front page news stories in the New York Times and the Washington Post to groundbreaking political research by Pew Research Center and Nate Silver’s FiveThirtyEight, Americans with disabilities were seen as a critical group of voters. Now that 2016 has passed, it is important for voters with disabilities to remain involved. Information on local elections, voter registration requirements and voting registration opportunities can be found on a variety of places. The League of Women Voters has built a comprehensive website with state-specific voting information and resources lists. You can find that information online at VOTE411.org. You even can find local events, volunteer opportunities or where to register to vote.